CRJA-IBI Group is collaborating with the project architects and the U.S. Department of State Bureau of Overseas Buildings Operations on the preparation of a master plan and construction documents for a new Consulate Compound in Erbil, Iraq. 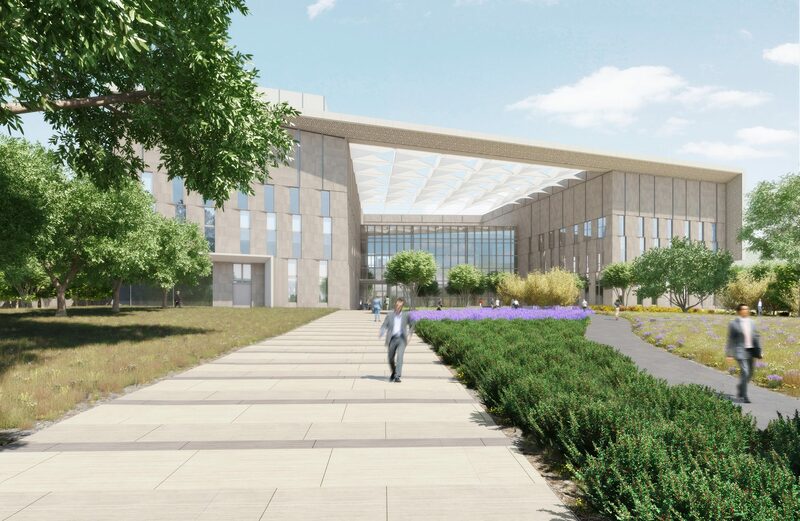 The project seeks to create a facility that is safe, functional, and inspiring–one that positively represents the U.S. presence to the host nation. The previously undeveloped 50-acre site will become one of OBO’s largest compounds, containing a consulate office building as the primary destination, with on-campus staff housing, community center, visitor housing, a marine residence, a consul general residence, and service/utility buildings to support the consulate operations. CRJA-IBI Group’s site design responds to the local environment, using materials that emphasize sustainability, durability, and visual appeal. Site amenities include representational plazas and gardens at the consulate main entrances and at the Consul General Residence for diplomatic visitors, a staff garden and strolling garden, where American and local staff can mix socially, a village green and well-shaded “streets” within the residential precinct, and recreational facilities including a pool, tennis court, and basketball court. As an organizing element for the arrangement of buildings running along the north and west edges of the core site, is the “dool”, a dry stream bed that will be wet seasonally, and will sustainably manage stormwater. 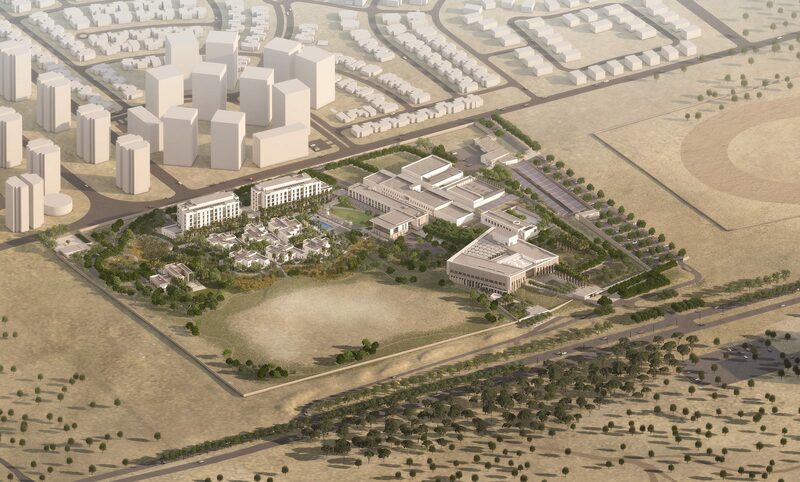 Running east-west through the site, connecting the New Office Building with the Consul General Residence, the dool will also serve as an attractive landscape feature, with strolling paths along both sides, to provide a variety of walking and gathering experiences for staff. The native oleander, found in natural dools throughout Iraq, will dominate the dool landscape, and be introduced in the compound’s entry road, and at the Residence Entry Pavilion, thus tying the entire site together from east to west. Much attention has been paid to the “day in the life” experience of American staff who live on the compound, providing gathering spaces at a variety of scales for solitary use, small social gathering, and large social gathering. 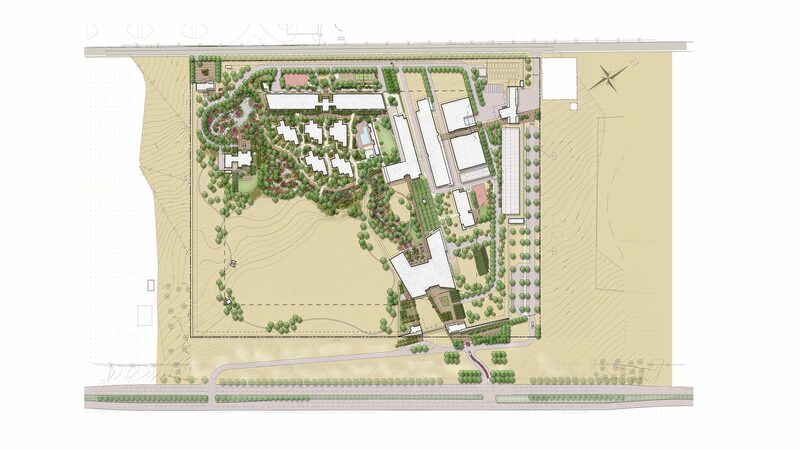 The core campus is planned with dense drought-tolerant xeriscape planting to provide an oasis-like environment in high-use areas, while large expanses of wildflower meadow planting is applied to the low use areas to further conserve water.